Many of TBM's standard buckles are made especially for them from brass and stainless steel. Our brass buckles are cast by hand from molten metal poured into sand molds, using equipment and techniques that are hundreds of years old. 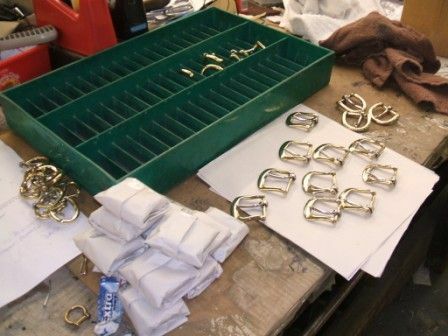 The cooled buckles are hand plucked from the resulting 'tree' and then tumbled, before each one is individually filed and finished by hand. Created by hand, in Walsall, England and finished to TBM's preferred high polish they are completed with a stainless steel tongue for strength and an aesthetically pleasing appearance, whilst also representing the family's traditional basis of their classic designs. Brass tongues and other finishes are available on request.